The article addresses the current discussion about swept-source (SS-) OCT and spectral domain (SD-) OCT as well as their respective imaging capabilities. Heidelberg Engineering harnesses the power of both technologies to deliver images that empower eye care professionals to make confident diagnostic decisions that will ultimately improve patient care. 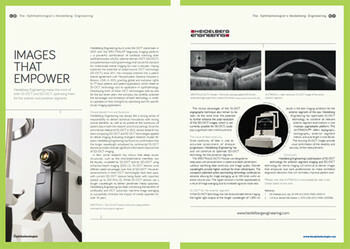 Read the full article to learn why Heidelberg Engineering promotes SD-OCT for imaging the posterior segment of the eye with the SPECTRALIS® diagnostic imaging platform and SS-OCT for imaging the anterior segment with the new ANTERION®* platform. * Please note that ANTERION is not for sale in the United States.